The 3D One is a hybrid compound and polish, which allows you to remove heavy imperfections while finishing the paint to a brilliant shine! When using a compound, generally speaking, you will be left with a little bit of haze on the surface that requires a second polishing step to remove. 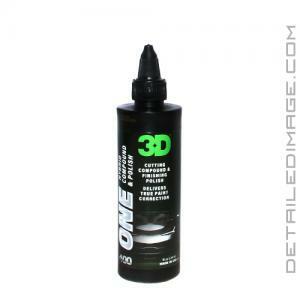 3D specially formulated One with a water-based formula packed with Nano Ceramic Alumina Abrasives to minimize hazing. These abrasives provide One with a great deal of corrective power (p1500 sanding scratches), yet it finishes the paint down extremely well. For some paints, 3D One can be a literal one step paint corrective formula but at times a follow up fine polish and pad may be needed. To adjust your results to your goals you can use 3D One with a cutting or finishing pad depending on the level of correction desired. If you are looking to add some protection or to finish down the paint further follow up with the 3D Speed which is a fine polish and sealant. This combination can produce amazing results creating a mirror-like shine and strong protection or feel free to use the 3D One by itself and you will be impressed with the results! To remove scratches; shake well and apply 4 to 5 dime size drops on your choice of wool or heavy corrective foam pad and buff a 2' X 2' area at a time, with slow back and forth overlapping motions. Once the scratches are removed, apply 4 to 5 dime size drops of One on a 3D finishing pad. Polish with the same overlapping motions, keeping the pad flat to the surface. When the holograms and swirl marks are removed, wipe off residue with a clean microfiber towel. 3D ONE hybrid cutting compound and finishing polish accelerates polishing performance. 3D ONE has specially engineered Nano Ceramic Alumina Abrasives that easily corrects paint scratches using a DA or high-speed rotary polisher. 3D ONE is a unique product; apply on a cutting pad to remove heavy scratches and then apply on a finishing pad to deliver an exceptional high gloss finish. It's easy to use, easy to clean up and leaves the perfect finish every time. Works best when applied in shaded areas, but is also sun friendly. To remove scratches shake well and apply 4 to 5 dime size drops on your choice of 3D wool or Spider-Cut foam pad and buff a 2'x 2' area at a time, with slow back and forth overlapping motions. Once the scratches are removed, apply 4 to 5 dime size drops of 3D One on a 3D Spider-Cut finishing pad. Polish with the same overlapping motions, keeping the pad flat to the surface. When the holograms and swirl marks are removed, wipe off residue with a clean microfiber towel to reveal TRUE 3D PAINT PERFECTION. Tried this on soft Mazda paint and it was a dream to use. A combination of orange and white LC pads depending on defects and oxidation. I did not need a second step on this soft paint as it finished remarkably well. No dusting and wipe off was easy. I was working in 55-65 degree temps indoors for reference. It reminded me of working with Sonax Perfect Finish but less expensive. I look forward to trying it on other vehicles. The formulation seems to have a huge amount of lubricant. Using 4 pea sized drops on a 5 1/2 orange LC foam pad with a Flex PE 14-2 rotary on speed 2, I experienced a huge amount of sling. I appreciate it allows for longer work times, but the time saved using one compound/polish and just changing pads is lost cleaning up product sling. Don't get wrong, it does a commendable job of correcting and polishing. It's just seems to be messier than some other products. Maybe 3D will bring back Adapt, which I loved using. Really good one step. For the price can't beat it! !